UNIONVILLE, C.T., Jun. 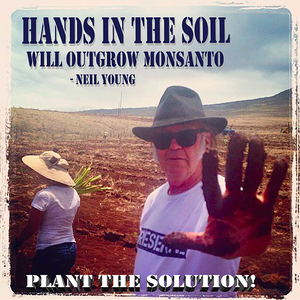 25 /CSRwire/ - GMO Free USA will be joining Neil Young + Promise of the Real during their upcoming tour to promote their new studio album, The Monsanto Years. The nonprofit will be taking GMO education on the road from July 8 in Morrison, Colorado to July 22 in Mansfield, Massachusetts. Traveling with a coalition of nine other nonprofits to raise awareness about industrial agriculture, environmental issues, and the negative impact of corporate control of government, GMO Free USA is proud to be part of the traveling Activist Village on location at each of the concert venues. “The Monsanto Years are here and we are living them. Monsanto is the poster-child for what is wrong with corporate controlled government in our world. Our upcoming record, The Monsanto Years, encompasses several associated subjects that millions of people worldwide are concerned about and active in. Earth is not ours. We are of the Earth. That's how I feel. When we plunder our own home we hurt our children and their children after them. I feel responsible.” says Young. Baker Creek Heirloom Seed Company, a GMO Free USA sponsor, adds, “We're convinced that GMOs pose serious risks to our health and to the environment. We're about healthful, natural foods--not some product from a laboratory.” GMO Free USA is a 501c3 nonprofit that educates consumers and other stakeholders about the potential hazards of genetically engineered foods, also known as GMOs, and advocates for the removal of GMOs from the food supply.